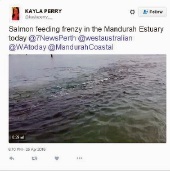 Halls Head Community College Year 9 student Kayla Perry said the dolphins were herding salmon on to the bank for about two hours. “About 50 people were on the foreshore watching,” she said. Kayla said it was so exciting to watch. She said she had never seen anything like it in the estuary. Fisheries manager of strategic policy Nathan Harrison said people can see large numbers of salmon pushing up around the coast from April to May. 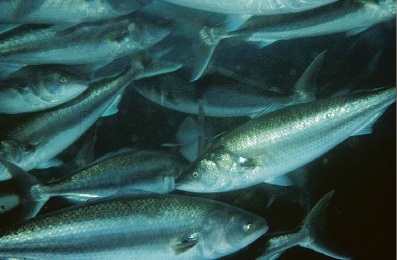 The spawning fish migrate as high as Perth depending on how cold the water is. People are getting good vision of salmon at the moment because in shore, cooler waters are replacing the warmer Perth currents. Once the fish have finished spawning, the Leeuwin current takes the fertilised eggs down the south coast again. “They’re actually not a true salmon species though,” Mr Harrison said. “They were named by early European settlers because they looked vaguely like the salmon found back in Europe. Mr Harrison said the salmon were more of a sport fish. “They do jump and carry on,” he said. He said they were not great for eating, but their oily flesh made them ideal for smoking. Mr Harrison recommended that swimmers and surfers get out of the water if they run into schools of salmon.